Are You a Winslow? : D.B. - "Goin' Full Speed"
D.B. 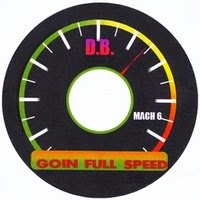 - "Goin' Full Speed"
Singer and guitarist D.B. brings us his latest single, a blues rock song, "Goin' Full Speed." The track was recorded in August at a studio in Vista, CA and is now available on CDBaby, iTunes, Spotify, Rhapsody and pretty much every other digital retailer. The recording artist D.B. not only sings and plays guitar for this song but also mans the organ duties on this track as well. The song was written by Dwight Osbourne who does not perform on the track. Overall, "Goin' Full Speed" is a solid, classic rock tune with a twinge of the blues on it. D.B. 's voice can be reminiscent of a country singer at times with a bit of a twang on it. "Goin' Full Speed" has a simple narrative, but one that is effective. Essentially, it's a love song with an extended metaphor saying that this love makes the singer feel like he's really moving fast. It's easy to get into the groove of this song. The selection of instrumentation really creates a solid sound that is uplifting and gets your body moving. Overall, this is a feel good song, one that invites you to lay back in the cut and let go of your worries as D.B. takes you on a trip through a story of amazing love. If you're looking for a track that brings back that classic blues rock sound, that will get your head nodding and your feet tapping, "Goin' Full Speed" will be a great addition to your music library. Head over to CDBaby.com to pick up the track for just 99 cents. Also available online at almost every digital music retailer.